Tariq Alhomayed, editor in chief of Saudi Arabia's leading daily Asharq Alawsat, says Russian President Dmitry Medvedev's long-distance call to Saudi King Abdullah was meant to throw today's "Friends of Syria" conference in Tunis into confusion. Looking at the wider picture, Lebanese analyst Rajeh el-Khoury says the monarch's curt response to Medvedev's explanation of the Russian position on Syria is proof the Arab-Islamic world's relations with Moscow are now on the downgrade. Medvedev got on the telephone Wednesday to make three long-distance calls to explain Russia’s position on Syria. His explanation fell on receptive ears in Tehran and Baghdad but didn’t sit well with the Saudi monarch in Riyadh. King Abdullah told the Russian president, "It would have been better if our Russian friends coordinated with the Arabs before using the veto in the Security Council" to block a resolution co-opting the Arab League peace plan. 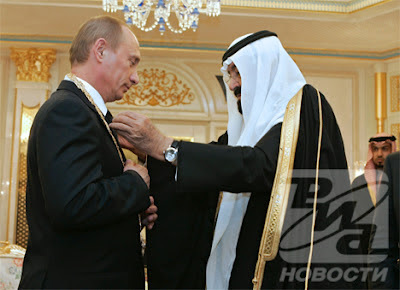 “But now, any dialogue about the situation (in Syria) would be futile… We cannot forsake our moral and religious stance in Syria,” the Saudi state news agency SPA quoted the Saudi monarch as telling the Russian president. King Abdullah, Alhomayed continues, took similar firm positions in his contacts with U.S. presidents over the years. He was the one to write George W. Bush telling him Saudi-U.S. relations were at risk if Washington did nothing to protect the Palestinians. He was the one to tell Bill Clinton: “Mr. President, friendship has limits as well,” when the latter urged him to be more positive vis-à-vis Israel’s leaders. He was the one to stand up for protecting Syria after the assassination of Rafik Hariri, despite the enormity of the tragedy. And King Abdullah was also the one to take the floor at the Arab summit in Riyadh to declare that the U.S. Army in Iraq is an occupation army. In contrast, says Alhomayed, Russia this week agreed to a daily two-hour cease-fire in Syria so emergency aid can reach beleaguered Syrian civilians. “Russia in other words, is telling Assad: Kill people 22 hours a day and spare their lives during the remaining two. That’s the difference between the Custodian of the Two Holy Mosques and the values of those striving to protect the children-killer in Syria. Rajeh el-Khoury, in Annahar, says the exchange between Medvedev and King Abdullah is bound to negatively affect Saudi-Russian ties as well as relations between the Arab-Islamic world and Moscow. Khoury says the king used the words “our Russian friends” during the exchange because Riyadh had tried hard to refute claims it was a satellite in the U.S. orbit. The monarch must have had in mind his own ice-breaking 2003 trip to Russia and Vladimir Putin’s return visit to Riyadh in February 2007, when he was decorated with the Order of King Abdulaziz.